ECA Watch members CounterCurrent, ECA-Watch Austria, and the Berne Declaration were instrumental in pressurising European governments to walk away from the Ilisu dam in 2009. In 2008 the German, Austrian and Swiss governments pulled out of the Ilisu Dam project in Turkey, reflecting the serious social, cultural and environmental risks the project posed. This was the first time any European government suspended an agreed export credit guarantee. Turkey however is still pushing ahead with construction of the dam. Turkey’s Ilisu Dam project was planned for the Tigris river in the 1950s, as part of the much larger Greater Southeast Anatolian Project (GAP). 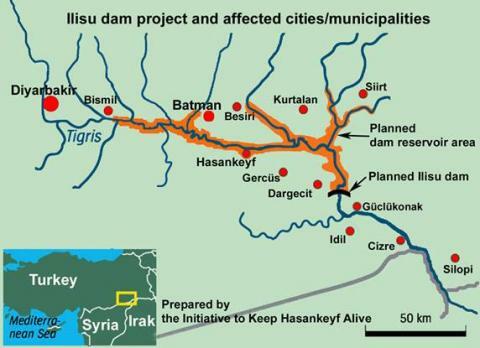 As Turkey’s largest dam project, Ilisu would have displaced approximately 65,000 people, mostly Kurdish; destroyed 400 km of river ecosystems; and submerge the 12,000 year old town of Hasaneyf. Ilisu was envisaged primarily as a hydropower dam, although flood defence was also cited in the rationale for its construction. Turkey’s first attempt to finance the Ilisu dam faltered in 2001/2 as, under pressure from intense campaigning on environmental and social concerns, almost all the banks involved walked away from the project. The government made another attempt to finance the dam in 2004/5, when a consortium of contractors applied for export credit guarantees in Austria, Germany and Switzerland. These ECAs offered their support on condition that certain international standards were met. In 2005 Austria, Germany, Switzerland and Turkey negotiated 153 conditions for ECA financing of the Ilisu dam. These included standards for resettlement, environmental protection, cultural heritage, and transboundary impacts. The 153 conditions were not made public until after the export credit guarantees had been approved. When NGOs and international experts were able to see the conditions, many argued that they were insufficient to bring the Ilisu project in line with international law or World Bank standards. If there was still no evidence of improvement within 180 days or no certainty that the conditions would be met in the future, the contracts would be cancelled. In 2007 contractors began expropriating villages closest to the Ilisu construction site. The Berne Declaration revealed major problems with the exercise, with very poor compensation for the displaced villagers and a lack of resettlement land provided. Experts commissioned by the ECAs to monitor the implementation of the 153 conditions confirmed these problems. This failure to adhere to the conditions led Austria, Germany, and Switzerland all took the first step in the exit procedure by issuing an Environmental Failure Notice on October 6, 2008. Despite the notice, and in violation of the export credit contracts, construction of the dam continued regardless. Therefore on 23rd December 2008, all three governments suspended their export credit guarantees. Even following suspension of the export credit guarantees, contractors continued to push ahead with removing villagers from the project affected area in a way that violated the 153 conditions. The Ilisu dam project was a subject of widespread resistance both within and outside Turkey. Thousands of people demonstrated in Hasaneyf, the ancient town that the Ilisu dam would destroy. Activists blocked the Brandenburg gate in Berlin and the headquarters of the Austrian ECA. A worldwide petition to stop Ilisu dam and preserve the region as a UNESCO world heritage site attracted thousands of signatures. Visit the Stop Ilisu dam campaign page.